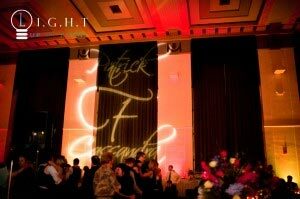 When it comes to lighting design, there are some features that help to enhance your event. Some venues are known for some of the factors below, while others are common. Read our list below for items that enhance your lighting design. High ceilings are great at giving you even color saturation. This also means you will have a nice ceiling wash around the perimeter of your room. Also vaulted ceilings make it more economical to wash your ceiling in color. The longer the distance the fixture is throwing light, the wider the beam angle. It is important to confirm the availability of a dimmer switch at your facility. If you want to light up a room with color, then the house lighting has to be reduced. The darker your room, the more vibrant your colors will show up on walls and ceilings. Most venues have their house lighting computer controlled, so dimming is not an issue. Dimming control should also be applied to miscellaneous fixtures like Japanese lanterns. Let’s say you would like to wash the canopy of a tent, make sure any other fixtures in the area are on a potentiometer. You would not want Japanese lanterns to overpower your room with lighting. This reduces the notice-ability of your lighting design colors. Just like having a bright room, dark walls reduce the notice-ability of lighting design colors. Think of it as a blank pallet you are painting on. It’s efficient to have light warm colors for your walls. White or beige work best for reflecting the colors. Halls use similar color schemes; it makes it easier for decor. This means that facilities that are made of mostly wood would not work well with wall washes. If your walls are blah, then it is important that your lighting designer gives you suggestions on how to incorporate other elements. This includes image projection, center piece pin spotting, and ceiling washes. Some places have it and some don’t. By architectural features we mean the ability to highlight various aspects of your space. This can include pillars, outdoor landscaping, and wall sconces. Elements like his help to concentrate your lighting on different places in the room. This enables multiple focal points, which keeps guests from getting bored by looking at the same thing. Even if your hall has a generic layout, there might be some feature your lighting designer can highlight. Simplicity usually works best. So if there are no features to accent, your room should be well balanced with the same amount of fixtures on opposite walls. 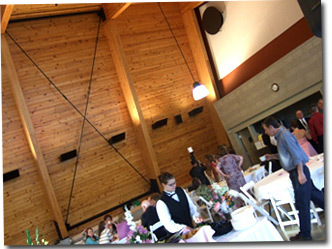 Most events have a pre-determined table layout. Table under lighting is perfect for head tables, or where distinguished guests are sitting. It gives an added emphasis on those seated at the table. 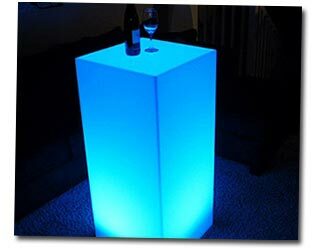 This can also be done easily with tables around the perimeter of the room. Cocktail tables usually have table under lighting to give a more festive look. If you would like the table to change with color, then a white linen or cloth should be used. Monograms can be tricky with some hall layouts. Depending on the layout of your custom design, might affect what position in the room your design will look best. Sometimes these fixtures can easily be moved throughout an event. This means your custom image can be placed at the front entrance as guests arrive, and maybe relocated onto a wall during the formal part of your evening. It is always a fun time when guests can dance inside the image. Just because your room is filled with windows doesn’t mean lighting design is out of the question. Most of the time there is a strip of wall in between windows; it works best to highlight these areas. If you are planning an event during the Spring or Summer, then curtains are a must for indoor events. If you want your room to pop with color before sunset, then you will have to reduce the amount of ambient light entering your room. Curtains are great at making sure your room is ready to go once your guests start arriving. Outdoor tented events require high power fixtures to color a tent during daylight hours. Reputable companies use energy friendly LED lighting which is great for the environment. These fixtures have low power consumption, and are widely used for indoor applications. If you are planning an event outside, then you might require additional power. As mentioned in the paragraph above, high power fixtures are required to color a tent before sunset. You may have to rent a generator. Keep in mind, a lighting design will need a certain amount of circuits free from any other current draw. This means there should be nothing else on the circuit which could cause interference. I like to spend my free time by reading varied internet resources and today i came across your blog and I believe that it is one of the best free resources available! Well done! Keep on this quality! Thank you so much for your kind compliment. I am glad visitors find our content both helpful and inspiring. If you have any suggestions for future articles, feel free to let us know!